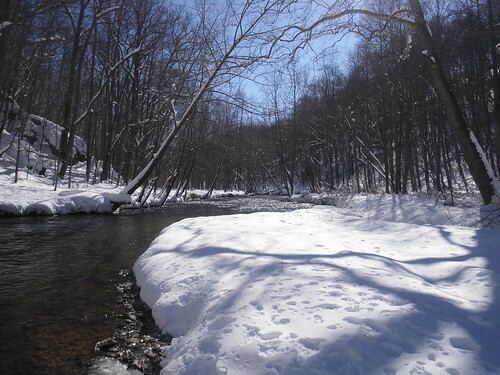 Winter won’t loosen its grip on the Baltimore region, and recent storms dropped roughly 6-9 inches of snow in the Hereford area. The steady snow fall today should only amount to a light accumulation. I’ve gotten a few calls about the access points, and parking situation on the Gunpowder. Yesterday an angler reported that Falls Road was clear, but the lots were not. The park usually clears them a few days after a storm, but some anglers planned to push through or shovel a few spaces. Masemore and York are clear for anyone looking to wet a line. The Gunpowder is flowing at 144 Cfs and water temps are in the upper thirties. Most anglers reported a few fish in a few hours, but a couple anglers mentioned catching between six to twelve trout. I felt the itch to get out a few days, so I suited up and the hit the river. The high for the day was just above freezing, so I wasn’t surprised the lot was empty. The river welcomed me back from Chile by letting me know my waders had a hole in the foot. I toughed it out for an hour, landing four fish on nymphs. The following day brought me back with a different pair of waders, and temps just below freezing. The icing on the guides wasn’t too bad, and the Didymo was surprisingly sparse in the Falls Road section. I stood in one fast riffle for an hour, putting drift after drift through the same seam. Every ten to fifteen drifts the indicator shot under, and I caught some feisty wild browns. Three browns were holding in really fast water, and not the slow tail out. A few of the fish went into the fast current and took line off the reel. I lost a really nice brown on a hook set, and watched the fish launch out of the water directly under my rod tip. The knots and 5X tippet held, but the head shaking and barrel rolls pulled the hook free. The trout was broader than long (16-17 inches), and was easily from finger tip to elbow in length and thickness. I lost a few other smaller trout, fumbling with mittens and slack line. The fishing seemed an improvement from the low flows before the holidays, and I hooked 3-4 fish an hour on both days. Two hours was plenty of time to hike along the river, and put a bend in the rod at the warmest part of the day. The shop has a number of patterns that worked for me, so swing by and we can direct you to some good areas. 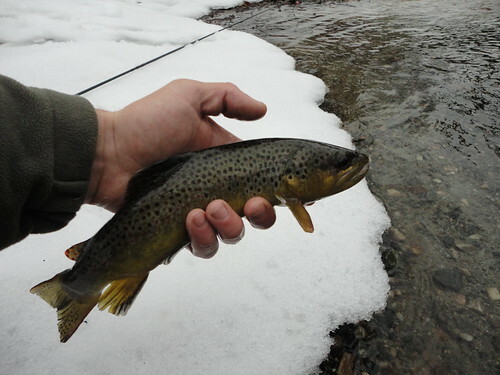 The latest video is a few quick shots of some Gunpowder browns caught in the cold. This entry was posted in fishing report, video on January 28, 2011 by Jason du Pont.